Eugene V. Thaw was a well known art dealer, collector, and author. He received his BA from St. John’s College in Annapolis and enrolled in the graduate program in art history at Columbia University for two years before leaving to become an art dealer in 1950, founding E. V. Thaw & Co. at the young age of twenty-three. 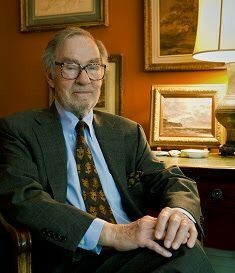 He was a founding member of the Art Dealers Association of America, and served on the association’s board since 1964 and served as president from 1970 to 1972. A critic of old master and modern art alike, Eugene has written numerous articles on aspects of art and art criticism that have appeared in The New York Review of Books, The Times of London, The New Criterion, The New Republic, and The New York Times Book Review, among other publications. Eugene began a formal association with The Morgan Library & Museum in 1968, when he was elected to the Morgan’s Association of Fellows and as a Trustee in 1988. He donated drawings to the Morgan by artists such as Rembrandt and Picasso and ephemera such as letters written and illustrated by Vincent van Gogh. In 1991, Eugene made the dedication of the Morgan’s Clare Eddy Thaw Gallery possible. A generous gift in 1999 transformed the Morgan’s conservation lab into the world-class Thaw Conservation Center. Eugene and his wife's personal collection of over 400 master drawings was started during his earliest days as a dealer and became a promised gift to the Morgan, collectively known as the Thaw Collection which encompasses virtually the whole of Western art with renowned strengths in sheets by 19th century French and German artists, superlative modern drawings, and works by 16th- and 18th-century Italian artists and 17th-century Dutch and Flemish masters. Among the his first gifts to the Morgan in the late 1960s were drawings by 18th-century Italian draftsmen Giovanni Battista Piranesi and Francesco Guardi, which were shortly followed by examples from the hand of French artists Jacques Callot, Pierre-Paul Prud’hon, and Paul Cézanne. These initial gifts eventually led to the Morgan’s first exhibition of the Thaw Collection in 1975. At that time, the couple decided it would be more satisfying to collect for an institution and as Eugene put it, “hitch myself to the Library’s star”. The couple promised their collection to The Morgan Library & Museum. The couple also assembled significant collections of Native American art, bronzes from the Eurasian steppes, metalwork and jewelry of Migration-era tribes, 19th-century staircase models, and watercolors of interiors. Eugene was an active board member of many cultural and education institutions throughout the world. In 2003 he received the Hadrian Award from the World Monuments Fund in recognition of his work in advancing the preservation of world art and architecture.